Forty years after his death, Jimi Hendrix still looms large thanks to the endless amount of previously unreleased recordings that has been packaged and repackaged for fans and future generations still yearning for more of the guitar legend’s music. It culminates in this new 4 CD/1 DVD box career spanning set which a majority of which are never before released music of alternate studio versions and live songs. 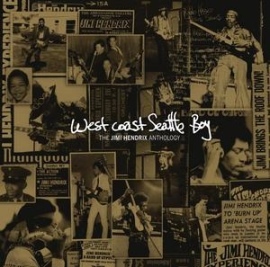 What makes West Coast Seattle Boy stands out from previous Hendrix retrospectives is that it includes music that featured Hendrix as a sideman for other artists in the early ‘60s prior to forming the Experience. Disc one features soul sides that Hendrix recorded for the Isley Brothers (“Testify”), Little Richard (“Dancing Around the World”) Don Covay (“Can’t Stay Away”) and others. They reveal a bit of the talent that would soon emerge as the set runs through the music on the remaining three discs with the Experience and the Band of Gypsys including such standbys as “Purple Haze,” “May This Be Love,” “Fire” and “Foxey Lady”; even a song he did with Arthur Lee and Love, “Everlasting First” is on this set. West Coast Seattle Boy concludes with “Suddenly November Morning,” a reflective soulful solo acoustic number recorded in Jimi’s New York apartment a few months before he died in September of 1970. It’s lovely as it is moving. The set is completed with a great documentary told Hendrix’s own words, accompanied by amazing footage, and wonderfully voiced by Bootsy Collins. It’s a great introduction for those who never really knew Hendrix’s story and will come way with a fuller appreciation of his genius and legend.